Villa Livadia; an Asian modern style villa especially designed for luxury getaways. 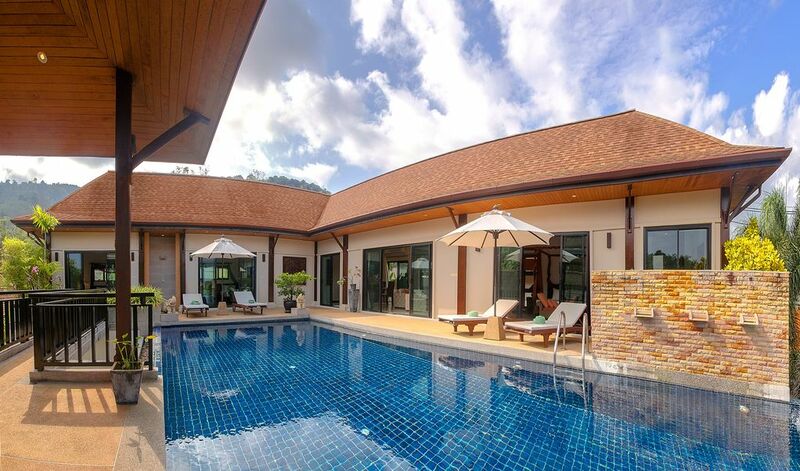 For those who are looking for summer holiday rental villa in Phuket, this is definitely the villa for you. The villa is close to the beautiful beach of Nai Harn; this villa, built to the highest standards, combines the amenities of modern living with a tropical atmosphere. The villa has been built around a large 14 x 5 meters infinity edge pool. This villa in Phuket offers 4 bedrooms all with en-suite bathrooms, a large living and dining room and a highly equipped fitted European kitchen. Each room of the villa opens onto the large swimming pool, sundeck and sala. All rooms in the villa are fully air-conditioned. Three times a week cleaning service, swimming pool and garden services are provided in the villa. Not far from the villa, you will find Rawai Beach,with its local seafood restaurants and traditional long tailed boats which will take you around surrounding islands. Nearest Restaurants/cafes : Banana Corner, Thai Lagoon, Davincci, Crepes Village, German bakery. I'm a Chinese Mandarin native speaker, I'm currently living in Hong Kong. I'm also fluent in English and Russian. I love travelling in different countries, and also enjoy staying in my villa. Villa Livadia is a beautiful place to spend a relaxing holiday. It is close to the pristine Nai Harn beach while still offering privacy and quiet. Many guests love our large infinity swimming pool, the size of the pool is 14 x 5 meters. The view from the terrace is excellent. The land area is almost 800 square meters. The villa is close to the beach while at the same time being private and secluded. There is an outdoor shower on the terrace. You can use it conveniently before and after swimming. There are a table and four chairs in the Thai sala near the swimming pool. BBQ is available. Baby chairs are available. Other facilities for baby, such as toys can be rented in Phuket. Car and motorbike can be picked up and leaved in the villa if you rent the car through our partner car rental company. Taxi service can be arranged. Tour can be arranged. Water and electricity usage is charged locally, based on meter readings. 1) One of the 4 bedrooms is located downstairs, and it had an unfortunate musty/moldy quality to its air. The room had an air purifier, but even with that running 24/7 the air was still not good. All in all, we had a wonderful time here at Villa Livadia and gladly recommend it to others as a highly enjoyable way to experience Phuket. The property was very clean and well managed. This was perfect for our vacation. The villa itself is in a quiet neighborhood and the neighbors are nice as well. The cleaning crew was very respectful of our space if we were in the house during cleaning. After long days of traveling and tourism related activities, it was nice to have a quick swim in the pool. I would definitely rent this space again if I ever travel to Phuket again. Had an amazing time here, would love to come back again! Beautiful house, great location, excellent service! Me and my family had a great time at the villa, we wanted a relaxed summer holiday and got exactly that. The location is splendid, being secluded and private while at the same time close enough to the beach and everything else the region has to offer. I hope to be able to return in the future! Stayed here for 10 days with our 3 teenage kids, the villa was absolutely perfect. Huge spaces, the rooms are awesome and the pool is incredible. The photos don’t do this place justice. You will need to get a taxi back from beach after a long day. Cost is 200B which is so reasonable. Special thank to Kris for greeting us and helping us during our stay. We will definitely be back !! Our first trip to Thailand and first VRBO experience. We loved it! Nai Harn is a beautiful place. Quaint small town at the southern most tip of Phuket Island. Our family of five (3 Boys- 18, 16, 13) rented a car and drove all around the island. There was not another town/beach/village that we visited where we would have rather stayed. We were easily within 30 minutes of several busy and secluded beaches, elephants, Buddhist temples, massage parlors, boats, scuba diving adventures and great restaurants. The location is perfect...close, but secluded and off the busy roads. The home was fantastic! A newer modern home, with four en suite bedrooms, a private swimming pool, full kitchen and well furnished. It was a dream! The hardest part was getting to the end of the week and wondering why we didn’t stay for another. Paying for electricity and water had me a bit nervous throughout the week, and we were careful to turn off the A/C and lights when we left the Villa or went to bed for the night. At the end of the week, we paid just over 4,000 Baht..$135 USD. Not bad at all considering the great WiFi, ample hot water and crystal clear swimming pool! Sonia...thank you for the great opportunity, and for your courteous and prompt management team. Kris was great and quickly responded to all our questions and was very flexible with our arrival and departure times. We will absolutely visit Nai Harn again, and hopefully someone reading this good review has not already booked the week we want!!!! Villa Livadia is a mere 45 minute drive from Phuket Airport. It is located in the most luxurious residential area of Nai Harn, just 12 minutes walking distance from Nai Harn Beach, which is rightly considered as one of Phuket’s most beautiful sandy beaches.Within 5 minutes of driving distance,You will find Rawai Beach,with its local seafood restaurants and traditional long tailed boats which will take you around surrounding islands. Within 15 minutes of driving distance, you will reach Chalong Pier, outfitted with speed boats awaiting you for unforgettable excursions on the Andaman Sea and Phang Nga Bay. Along the rocky shores of the southern-most tip of Phuket Island, Nai Harn is another of Phuket’s great beaches; for it is a favourite among sunbathers and swimmers alike. The water is calm and very clear, with excellent snorkelling opportunities off the southern headland.